Ireland 1846. The potato crop has failed for the second year in a row and Ireland is in famine. When Kathleen Deacey’s fiancé doesn’t return from a summer working in the Newfoundland fisheries, she faces a devastating choice—leave Ireland to find work or risk dying there. Despising the English for refusing to help Ireland, she crosses the Atlantic, determined to save her family and find her fiancé. But her journey doesn’t go as planned and she ends up in America, forced to accept the help of an English whaling captain, Jack Montgomery, to survive. As Jack helps her search for her fiancé and fight to save her family and country, she must confront her own prejudices and make another devastating choice—remain loyal to her country or follow her heart. A love story inspired by actual events, To Ride a White Horse is a historical saga of hope, loyalty, the strength of the human spirit, and the power of love. Pamela Ford is the award-winning author of contemporary and historical romance. She grew up watching old movies, blissfully sighing over the romance; and reading sci-fi and adventure novels, vicariously living the action. The combination probably explains why the books she writes are romantic, happily-ever-afters with plenty of fast-paced plot. After graduating from college with a degree in Advertising, Pam merrily set off to earn a living, searching for that perfect career as she became a graphic designer, print buyer, waitress, pantyhose sales rep, public relations specialist, copywriter, freelance writer – and finally author. Pam has won numerous awards including the Booksellers Best and the Laurel Wreath, and is a two-time Golden Heart Finalist. She lives in Wisconsin with her husband and children. Find out more about Pamela at her website, and connect with her on Facebook andTwitter. This was a book that really pulled at my emotions – on many levels. The history of the potato famine and what it did to the people of Ireland is well known. The British raped that country for what it could produce and let the citizens starve. The rich took what they wanted and damn the poor – it must be their fault somehow. Sound familiar? But I’m not ranting on today’s politics but rather reviewing a very well written book that delivers the history and the humanity with equal aplomb. Kathleen awaits the return home of her fiance but he fails to come back on the ship with her brother. As the potato crop continues to fail it’s Kathleen that is sent to find work to send money home. She figures at the same time she can try and find what happened to her love but all does not turn out as she plans. She ends up shipwrecked and rescued by of all things, an Englishman. A man of the country she hates to the bottom of her soul. But he does her many a kindness and alters her thinking that all Englishmen are bad. She ends up in Boston where the Irish are not appreciated and finds her new life very difficult. This was a book that drew me in from the very first page. I had the worst time putting it down. Ms. Ford just drew me into the world she created and her characters truly came to life. It was a horrible time in history for the Irish (confession – I’m half Irish) and they suffered at home and abroad when they tried to find new lives. This is all represented in the book with a very well defined plot and strong character development. 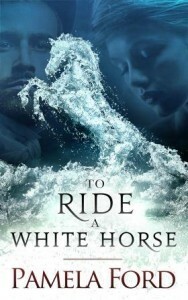 One lucky US reader will win a copy of To Ride a White Horse. Just enter as many ways as you would like on the Gleam widget below. Good luck everyone. Celebrate Dad with Cabela’s and Enter to Win!